If you still haven’t discovered the wonderful world of millets, you have to start soon. Given the versatility of millets, you will have fun cooking with millets. Whole millets can easily replace rice, couscous, bulgur and other grains. Millet flour is a great alternative for wheat flour. Millets are amongst the most nourishing grains. They are highly alkaline and naturally gluten free. They are easy to digest and in India, millet porridge is highly recommended for babies as well. The chena millet I have used in this simple stir fry recipe comes from the plains of Rajasthan. I love the slightly sweet earthy flavour and the fluffy, grainy texture of this little millet. The closest cousin for texture would be couscous. While they are the oldest grains, I wouldn’t be wrong to say that my generation completely skipped growing up on millet, which is why we also lack recipes with millets. I find it quite interesting to find old traditional millet recipes and also adapting common rice and wheat recipes with millets for a healthier alternative like in this stir fry recipe or bajre ki roti instead of regular wheat chapati. If you like this recipe, it will be great if you can leave a rating and/or a comment! Nutritious and tasty, millet stir fry makes a light refreshing meal. In this millet recipe, I have cooked chena millets (Proso millets) with plenty of vegetables to make a healthy vegetarian stir fry. Wash the millets in a fine sieve under running water. Soak for 10 mins while you prepare the vegetables. Heat oil in a deep pot. When the oil is hot, add garlic, green chilli and ginger. Sauté for a minute. Add chopped onions, other vegetables and all the spices. Mix well and cook for 2 minutes. Drain the millets and add to the pot. Add 2 cups of water (you can also use vegetable stock for added flavour) and cook on medium high till there is a boil. Reduce the heat to low and cook covered, with a little opening, till all the water is absorbed and the millet is cooked through. Garnish with fresh coriander leaves and serve with lightly spiced homemade yogurt. Different millets can take different amount of water to cook. Chena millet (proso or little millet) takes two but some may take 3 times water. I have used slit green chilli without its seeds to keep the heat low. For a spicier stir fry, finely chop the chillies. If you are adding stock, make sure to check on salt as stock usually has lot of salt. I hope you try this a millet-y twist on the popular veg fried rice. I am sure you will enjoy it. There is no hard and fast rule to the vegetables that can be added to this recipe. Just make sure to add a mix of soft and crunchy vegetables. Send me a question, a picture, leave a comment or connect with me on Facebook, Twitter, Google+, Pinterest and Instagram. Would love to start a conversation, share recipes, cooking experiences and food stories from India and around the world. Is it crazy that I’ve never cooked with millet before?! This looks so healthy and yummy, though. I’m going to do some research on millet and get cooking! Thanks for the recipe! I plan to open a small eatery where I only serve dishes made out of millets. It could be vegetarian or non vegetarian or with just eggs. Could you point me in the right direction. That’s a great idea and good luck! I can possibly help you with recipes of local millets in the region where you plan to open your eatery. We do have one such restaurant in Udaipur that started with the concept of serving only millets but given the economics of running a business, they had to start serving other grains also.. Let me know if you would like to connect more deeply on this. And lots of best wishes! I love the variety of flavors in here. This looks like a fun alternative to fried rice! Amazingly simple and a healthy recipe. 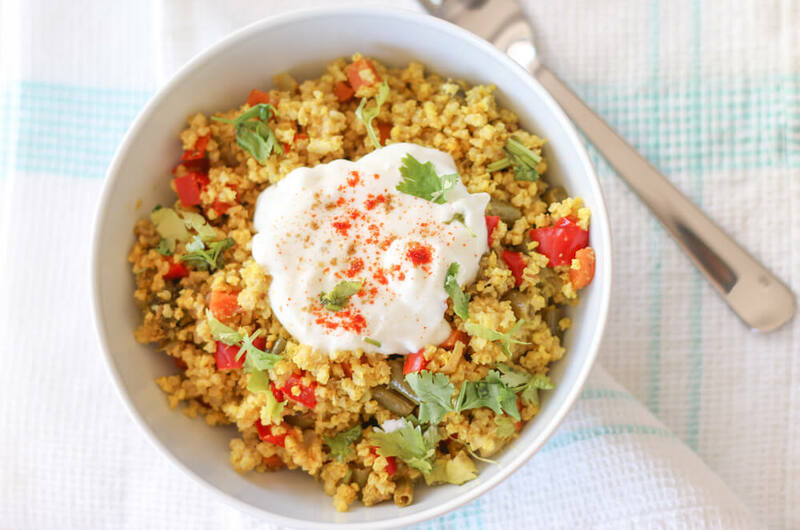 Love this millet recipe and am surely trying this soon. This dish looks so fresh and healthy. I have a similar dish that I make with bulgur wheat. Thanks for sharing! Thanks Analida for your love and rating! I should try it with Bulgar too 🙂 I have cooked bulgar burgers but didn’t make a stir fry with it yet! I have yet to cook with millet. I used millet flour, but not the grain. It looks like a great alternative to the other grains, it looks good and I bet it tastes wonderful with all the veggies! I’ve never cooked with millets before, but this looks too amazing to pass up! Can’t wait to give them a try! I love millet! Your recipe looks so delicious! It is funny that even though it is an old grain, most people haven’t tried it. I can’t wait to try your recipe! It is funny and also sad. In India, we traditionally had no wheat crop and the grain was only millet, but it now needs a revival! I’ve cooked with millet a few times and really enjoy it. Love the healthy and flavorful dish you’ve created with it here! 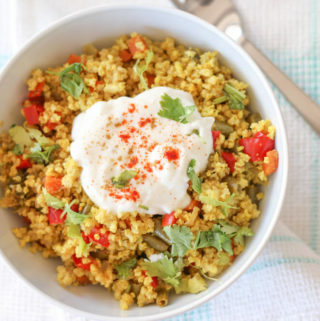 Millets are so healthy and this recipe sure looks yum! Need to try millets this way too. and thanks for your rating! I also need to learn a lot more recipes with millets. 🙂 It is always fun to explore new ways of cooking. I love adding yogurt on top of dishes – I don’t think I’ve ever done it with a stir fry though. This looks delicious! I have never tried millet. I am going to have to look into this, I love healthy grains and trying new foods! amazing recipe. thanks for sharing it. i would love to try it. Do let me know if you have any questions. Would love to see how it went! Doesn’t it look too much yummy?